Water has a quality unlike no other. People seek out water all seasons of the year and times of the day. A winter at a tropical beach, a sunset or moonlit walk alongside the ocean, or the sun reflected upon a lake or river. Then there is the great feeling of jumping in a body of water, swimming, wading, or just getting your feet wet. A pool or spa can bring a piece of this back to your own home and yard. With a pool, you can swim as often as weather and time permit. What better way to relax and get exercise than in your own swimming pool or Spa. There are many different styles of pools to choose from. If you want an in ground swimming pool, you will need to hire a company that specializes in building pools. There are standard oval, and square shapes, as well as just about any custom size and shape that you can imagine. An in ground pool can be made with various depths, as well as inclines/declines. Above ground pools are more popular now then ever before. 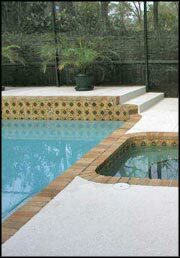 There are resin above ground pools that remain in place year round. New to the market are above ground inflatable swimming pools that are also very affordable. Where pools can provide exercise, not many things feel better than relaxing in a spa, or hot tub at the end of a day, or the end of a workout. Spas can be purchased in all types of sizes for both indoor and outdoor use.